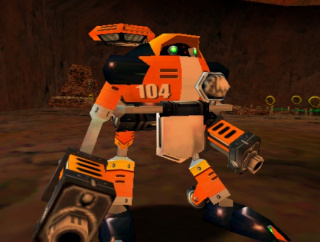 E-104 ε, commonly known as Epsilon, is an Eggman robot from the E-100 Series, appearing in Sonic Adventure. An orange android who can fly using his Jet Booster plate, Epsilon functions as a boss for E-102 γ at the end of Red Mountain. Epsilon is first seen aboard the Egg Carrier in Gamma's story, when Dr. Robotnik gathers the E-100 Series in the main hall to send them out on a mission: the capture and retrieval of Froggy. Eggman requires Chaos's tail, which has attached itself to the amphibian, in order to restore the God of Destruction to full fighting fitness. Gamma is dispatched to Emerald Coast while Epsilon, Delta and Zeta go to search elsewhere. Gamma is the last one to return to the Carrier - and the one who actually caught Froggy. Epsilon has brought back a pink and blue frog, and the Doctor is rather unforgiving of failure, banishing Delta, Epsilon, and Zeta with "All you worthless hunks of junk, begone!". Along with his brothers, Epsilon is teleported away in a cyan beam of light. E-104 is next encountered only when Gamma arrives to kill him. After witnessing the transformation of E-101mkII, E-102 reneges against Robotnik and decided to "liberate" the E-100 models by destroying them. Gamma hunts down his younger sibling in the volcano at Red Mountain, and after a fierce exchange of missiles in the boss fight, Epsilon is destroyed. E-104 Epsilon during the boss fight.